I’ve written before about the protean nature of Thomas Ligotti’s horror fiction; the ways in which he seems completely at home writing in genres as diverse as Lovecraftian grotesque or the ghost story, slasher fiction, philosophical horror, vampire mythos, demonic possession etc. and etc. He’s equally comfortable subverting and corrupting the well-established tropes of these categories as he is paying sentimental homage to their more classical incarnations. And while his mastery over so many different genre forms is undoubtedly impressive, it’s a little too easy to accuse Ligotti of over-reliance on the anaphora of his forbearers; the once-original motifs that have since become tired and predictable through over-use, Hollywood hack and the familiarity of age. This isn’t to say those stories in which he channels Poe or Aickman or Lovecraft or Heym are disappointing or unsuccessful, quite the contrary, but horror fiction – perhaps more so than any other genre – relies on constant innovation in order to fulfil its ostensible mandate: to provoke, shock and disturb. Even when Ligotti is distorting classic designs, he is still nonetheless working within structures that were mastered elsewhere, by other writers. Predictability is the greatest crime a work of horror can commit. 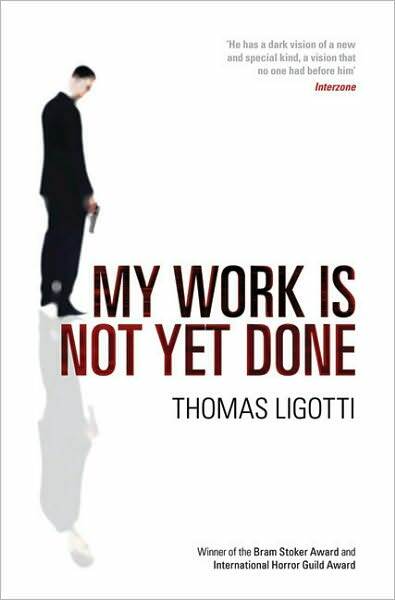 Thankfully, My Work is Not Yet Done signifies the point at which Ligotti steps out of the shadows of the old masters and does something we all secretly hoped he was capable of: writes a novel in a genre truly his own. The descriptor “Corporate Horror” is perhaps a crude epithet to plaster over the title page, but it’s a useful term, and one which I’m sure will soon become a valid and commonplace part of critical vocabulary. The novel, as this appellation suggests, is about a man who works in an office – scary stuff, right? It’s true that the office space and the workaday routine has become common fodder for the literary mainstream – the pointlessness of it all, the existential ennui of routine and the black comedy of bureaucracy – but the office of My Work is Not Yet Done, though as mundane and ordinary as any other, is cast as a place of abject panic, despair and horror for our narrator Frank Dominio, whose prose is most poignantly characterised by his opening and oft-repeated refrain “I have always been afraid”. The book takes great pains to describe the head-splitting flicker of florescent office tube lights, the grotesque and unearned self-confidence of those in higher management, the never-ending barrage of non-specific and pointless paperwork and the unfair and unreasonably small ways Frank’s co-workers attempt to undermine him. The acts of selfishness and cruelty best described as “office politics” Frank knows he should ignore and rise above but which, simultaneously, seem deeply, personally, disgustingly offensive and hurtful. Ligotti’s pitch-perfect prose oscillates between a microscopic focus on unimportant, trivial details on the one hand, and a fetishisation of the mundane, vague, unspecific blandness of it all on the other: “He was of average height and build, average weight, average age”. The cumulative effect of this cloying and constant description is a sensation of desperate, claustrophobic loneliness, anxiety and horror as Frank trudges through his daily “maze of pain”. I was somewhat disappointed with the second half of the novel, in which some strange force Frank terms “the great black swine” grants him the power to fulfil all of the sadistic fantasies of violent murder he harbours against his co-workers “I wanted to do things to Richard that would make the sun grow cold with horror”. The jarring tonal shift from paranoia and solipsism to supernatural hyper-violence really irked me: it converges clumsily with the insightful social criticisms of the novel’s first half in a way that almost undermines the book’s sense of hopelessness. I mean, the novel’s second half is well-conceived, well-structured horror with some gloriously imaginative comeuppances directed at the book’s most perversely unpleasant characters (and I especially liked Frank’s hubristic fall when he presumptuously ignores the single caveat and condition of his new supernatural gifts – powers which are otherwise in danger of being so all-encompassing and poorly defined as to be narratively uninteresting), but the whole supernatural element is just so, so unnecessary. The book’s aesthetic identity is fully realised in its first half. The fact that Ligotti crafts such disturbing and panic-ridden horror from what is essentially a description of a man going to work is the book’s most striking achievement. The rest is good Ligotti, but perhaps the writer’s ideas would have been better served had these two parts been kept entirely separate. It goes against my every readerly impulse to say this, then, but when Ligotti offers the suggestion that the book’s supernatural elements have entirely rational and psychosomatic foundations, I embraced it whole-heatedly. Given the choice, I would usually pick the more fantastical of any two feasible textual interpretations (it’s just more fun that way), but the possibility that My Work is Not Yet Done doesn’t collapse into hocus-pocus-fuelled demonic mayhem, though by far the least substantiated interpretation, is by far the most interesting reading. The nine-to-five office space of corporate drudgery, with all its potential for loneliness, repetition, anger, desperate anxiety and claustrophobic despair is horror enough: there’s nothing more to add. This entry was posted in Novels, Reviews and tagged Corporate horror, My Work is Not Yet Done, Thomas Ligotti. Bookmark the permalink.